Staff shortages, losing EU funding and uncertainty were identified as key risks of a Brexit vote at an EventHuddle debate on the EU on 14 June. 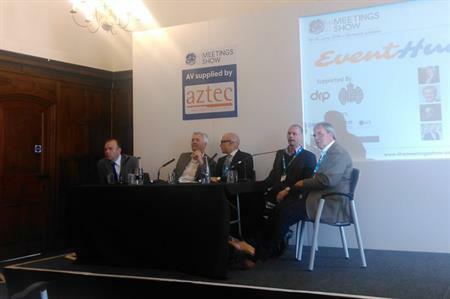 The EventHuddle debate, which took place at The Meetings Show, was chaired by The Experience is the Marketing’s Kevin Jackson. The panel consisted of Alan Newton, COO at Eventopedia; Chris Heaton-Harris, MP for Daventry; Nick de Bois, founder of Rapiergroup and MP for Enfield North 2010-2015; and Simon Hughes, managing partner at MCHA. The debate centred around concerns from the audience on the topics such as the possible decline country’s attractiveness if we leave the EU, the loss of funding and the possibility of losing staff members. At the debate the issue of losing hospitality employees, many of whom have travelled to the UK to work as EU nationals, was raised as a topic of concern. Hughes argued: "Over 800,000 Polish nationals live in the UK and around 100,000 of them work in the hospitality sector, in the venues and hotels that service our events and look after our delegates and guests. If we leave the EU and they’re not as welcome here, who is going to step into all of those jobs?" However, Heaton Harris countered that the UK will be able to increase immigration from countries outside of Europe, and that those Europeans that have already moved to the UK will not be at risk of being asked to leave. "Currently we discriminate against skilled workers from outside of the EU owho want to move here, in favour of those from the EU," he said. "It’d be better to bring in skilled workers rather than just anyone from the EU." The panelists on the remain side of the debate pointed out a number of positive things that the EU has done for the events industry, such as the ease of getting carnets to allow the free movement of people and goods for events and exhibitions, and the funding that has allowed once failing cities such as Liverpool to become key players in the industry. Newton said: "I grew up in Liverpool when it was on its arse. The government at the time were willing to let it rot and it had been struggling for many years, so I almost trust Europe to spend the money better. The EU has done great things with Liverpool in last 10 years, they’ve invested £2.5bn into the city and the wider North West Region, which has seen the ACC being built. The International Festival of Business is in Liverpool because of EU funding, it’s created hundreds of opportunities." The leave panellists however claimed that the funding was only delivering back money that had been sent to the EU in the first place, and that it would be better to have our own elected officials decide how it was spent. Heaton Harris said: "The money that they spent is our money anyway, we pay to the EU and it gets recycled back to us. However we’re told how we have to spend it and its often on agriculture and some regional structural funds." "We won’t lose that money that’s being invested in the city," added de Bois. "My argument is that the decision on the referendum should not be on whose politics you like better, it’s that elected officials should be making the decisions, so if you don’t like them you can vote out the government and get a new one. The EU is self appointing and we don’t have the right to remove them." Another worry that was raised was that in the event of a leave vote, the uncertainty of what could happen next might mean a drop in business for the events industry, as clients curtailed their spending. Hughes said: "Uncertainty is bad for our industry. If there’s a brexit vote then it may take years to decide what will happen when we leave. This could mean that clients will hold off the stuff they don’t have to spend money on." De Bois argued that while uncertainty is bad, there are far bigger uncertainties in the market at the moment than the EU vote, such as China’s economy. Has the Conservative government boosted the profile of the UK events industry?